Only used my first bit of greenstuff yesterday to make some puss on a dreadnought - had no idea it was so versatile. Definately looking forward to the next installment! Thou shalt not kill, I shall..
"Welcome to 5th Edition, you can now kill ten men by shooting one man ten times. " Can you make this into a tutorial for the librarium when your done? This would save us sifting through praise (rightly deserved though!) to find the next step. I really like how the masters on this site, like Doghouse, Boltman, Starks, to name a few have made have made "dumbed down" tutorials for those of us who are less artistcally inclined. Just reading your Gothic marine tutorial improved my GS skills. Keep up the great work! im working on some of those gothic marine models myself, any updated doghouse?? Thanks for devoting so much time to this, it's simply great. Don't worry guys I will be updating in the near future. Having some real life issues sapping my free time and finances but the second part is coming. Bigger-than-Jesus: It may be tricky at first but I'm breaking the torso tutorial down so anyone can do it. You can use regular marine torsos but they look a little small, the assault torso is probably better than the standard version because of the cabling bulking it out. There are loads of fancy tutorials out there for armatures and whatnot that can put people off trying to sculpt. I taught myself so will be passing that knowledge on here shortly, you don't need to be Jes Goodwin to use my method and it uses basic materials that everyone can get hold of like bits of sprue for example. Blindhamster: MATE!!!! Long time no see, great to hear from you again! Merkava: Excellent! Always does me some good to hear that my tutorials help improve the skills of others as it's the main reason I post on forums. When it's finished I'll try and get a proper tutorial posted in the Librarium. My plan is to make a squad or two of my DIY Iron Hands successor chapter, but then use them as a deathwing terminator force true-scaled regular marine being as tough as a regular terminator etc. Which would mean true-scaleing a rhino to counts-as a land raider..
My god Doghouse your skill still truly amazes me. I've seen your threads on the true scale marine and felt like my skill was nowhere near good enough to give it a bash, but with this thing i'm going to try it out!!! Looking forward to seeing more mate, just one question though - have you used your guys in games and are they legal enough? If mine ever make it to battle I'd field them as terminators, and maybe strip down the tactical squad set and field them as scouts for the troop choices. I had a quick start last night but looking at the legs on the sprue I decided on some of them, in particular the one I started working, the thighs seemed a little short, so I'm currently separating the groin by both hips in order to bring the tops of the thighs closer together and lengthen them. Not by much. Thanks for this tut doghouse, really puts mine to shame (but dont tell anyone i said that) But can you tell me what you use for the left arms as i have made 20 of these (estimating how to) and the combat termie arms limit the left arm pose. Looking forward to the next bit. Thanks for the inspiration to start my truescales!! Really sorry about the dely but I am still working on it...honest. You know you play too much 40k when, after a 'good night' with your significant other, you perform a sweeping advance instead of letting her go to sleep. After you finish, you declare it a massacre, and attempt to consolidate D6 feet towards the shower and/or kitchen. thanks for the tutorial bring more knowledge! Nearly got a set of legs done Very, very chuffed with the way they're coming out, even though I've done them in a slightly different way, with a great deal more cutting involved. But what's the next stage!!!?? Plus I prefer the progress on the Cosmic Space Knight's (of Doom). so a good tutorial is really something I can use. So yeh... I would love to see this finished, rather sooner then later. Likewise. I no longer know enough of the 40k universe fluff to fully appreciate the CSK(od). This, though, I can appreciate. I'm not too keen on the fully green-stuffed torso though. The guy on the first page looks a little as though he's wearing a turtle-neck. That said, I still want to see this tutorial finished! As an old player returning from a break, I am intrigued by the actual scale Marines. Sooo Doghouse once this tutorial is done are you going to show us how to make an actual scale terminator, considering you use the Terminator Legs. I for one would love to have a Deathwing Army Kited up to Actual Scale and regulars DAs at actual scale talk about an Imposing Army. Thank You Doghouse and I look forward to the updates. 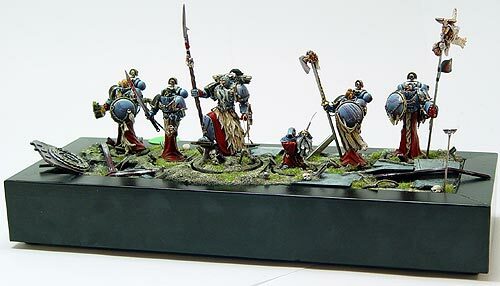 This tutorial or Cosmic Space Knights, oh man, choices, choices! Doghouse you need to clone yourself and do twice the work! I just got done doing the first test leg of actual scale marines. I am using ProCreate and wow its some good stuff... I have used green stuff before. But this is a major improvement. The Vaselin is amazing and lot easier to work with then just water alone. Now if only we could get the torso portion of this tutorial as that is one thing I am stumbling on right now. But no hurry Doghouse I fully understand Life requirements and the what not!